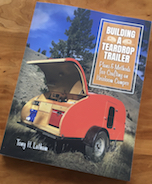 Teardrops n Tiny Travel Trailers • View topic - O.D.D. Version 1.0 An off-road teardrop build. Re: O.D.D. Version 1.0 An off-road teardrop build. Thanks everyone for the kind words, It has been a fun build so far. Not sure when I'll be able to get back to work on it, After 6 days and I'm still in a lot of pain. I am lucky with my job I work with people that are in surgery every day with nuro and ortho doctors. I was able to make a call last week and got in the next day with one of the better Nero surgeons at The Mayo Clinic, and got I'm not sure what is wrong. Looks like I'll need to see an ortho doc and lucky I have an in with one. I'm hoping to get to work tomorrow and see how it goes, start PT on Thursday. But how about some more pictures. Here are just a few random pictures I had on the camera. The start on the tongue box. If I had to pick the most difficult part of the build I would say it's the tongue box. Lots of angles. And I spent a lot of time making sure water and dust won't be able to get in. And probably way over built it. I'm going to do the tongue box different than the cabin. Just Baltic Birch, epoxy, and bed liner. I may do a high build primer if the epoxy doesn't sand smooth. I want to see how this goes for maybe for the nest build. The lid getting poly on the inside. Note the cardboard box with the yellow tape, that is a mock up of the battery I'm thinking of buying. Want to make sure everything fits in the tongue box. This is the third size box I made, just can't decide which way I want to go. Once the tongue box is done We'll be ready to get the inspection for plates. I have been looking into the process of getting plates here in AZ. We have third party companies that you can go to instead of the MVD (DMV). I hear that is the way to go and clam the build is under $1000. I have stoped at a few and found one that seems to know what they are doing and gave me some advice on what they look for. Maybe that will happen in a few weeks. FM82 wrote: Wow! Lots of progress. You were really holding out on us. Looks great, man. I'm really liking the craftsmanship of the galley hatch. I agree with you about the fenders. Since they can be easily swapped out, maybe go at it again, but change up the angles? Just imagining a limb, or something similar getting thrown up and getting wedged in between the tire and fender. Can you give some details on your roof edging? I'm torn between the vinyl insert style, or the one without. I prefer the look of the trim without the vinyl insert like you have used, but I'm not sure how well the rivets will hold water out over time. There is a little more room than is looks from the tire to the fender, I'm just going to live with it for awhile and see how it goes. I know a guy that has 35's on his Jeep and maybe I can put his spare on to see how it looks. I agree with you on the edge trim with the vinyl insert. I'm not not a fan but that is what I used. But not with the vinyl insert, I found this other insert that looks way better. I just got mill finish aluminum the place I ordered from had black anodized and I'm almost wishing I went that route. I sprayed first with acid etch primer then flat black paint. I hope it holds up. That insert does look much better. Looks to have a lower profile than the standard insert that I've been seeing. Where can I find that style? Nice work on the tongue box, by the way! FM82 wrote: That insert does look much better. Looks to have a lower profile than the standard insert that I've been seeing. Where can I find that style? Yes, that looks much better! I'll most likely be using the insert style trim now. Thanks, Todd! Neck and shoulders are defiantly some of the worst! & the colored Liner, Kinda like that too. 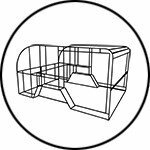 On my recent build of the flat deck utility trailer in Tucson, I made the mistake of saying what the actual cost of the frame materials cost, over $1000. Had to get a "bonded title" for the build, but it's no big deal. An insurance company did the bond, then it was $129 at ADOT for the permanent plate. I did the frame first on our teardrop build, then once the trailer was licensed, set the cabin in place so the plate was already on the trailer. 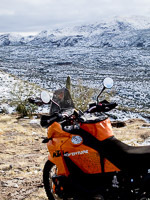 It's easier that way, but a bonded title isn't a big deal in Arizona, just another layer of state $ for the insurance company, trip & ultimately something to forget about later. Beautiful build by the way, did you weigh it yet? Sorry if I missed it in the build journal. My guess is 2300# with everything in place & ready to go. noseoil wrote: On my recent build of the flat deck utility trailer in Tucson, I made the mistake of saying what the actual cost of the frame materials cost, over $1000. Had to get a "bonded title" for the build, but it's no big deal. An insurance company did the bond, then it was $129 at ADOT for the permanent plate. Thanks on the info on plates. I haven’t weighed it yet but I think you are right. I may be replacing the rubber in the axles. PS waiting to hear if I need surgery on my shoulder/ bicep. I’ve worked maybe 2 hours on the camper in the last 3 weeks. Good luck to you with the shoulder, Todd. Hopefully they can get it all worked out for you, and get you back working on your build like you want to. I've been real bad about keeping this updated. I have been working on getting ready for a trip and haven't been taking pictures of the progress. But here are some photos from our first trip. We did two nights and drove about 550 miles, 40 or so off road. We camped with some new friends that have a Turtleback trailer with RTT. I'll try to get some close up shots of what I have done since the last build post. I had to just get a lot of things done temporality for the trip and am now going back to fix those things now. Your teardrop looks wonderful, and the photographs really show off the scenery. I really like the night shots with the stars. Inspires me to work to get ours finished! Congrats on the first trip! The trailer and scenery both look amazing. Okay, just between you and me. While you and your wife were sitting in camp, and your neighbors were crawling up and down their ladder monkeying with bedding and stuff, did you give each other an inter-camp eye roll?